Word travels fast and, as a result of Kestrel's highly successful operation at Chelsea, Walsall Football Club in the first division contacted them seeking a solution to their playing surface which (for those of you old enough to remember) was reminiscent of the Derby County Baseball ground of the seventies. 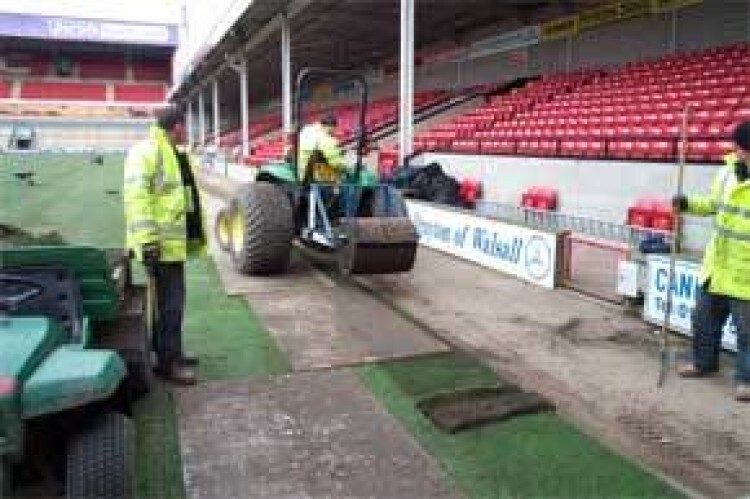 The problem with Walsall's pitch was a 75-100mm layer of what could at best be described as a heavy cricket loam capping the underlying 300mm depth of sand. This obviously impaired the drainage. 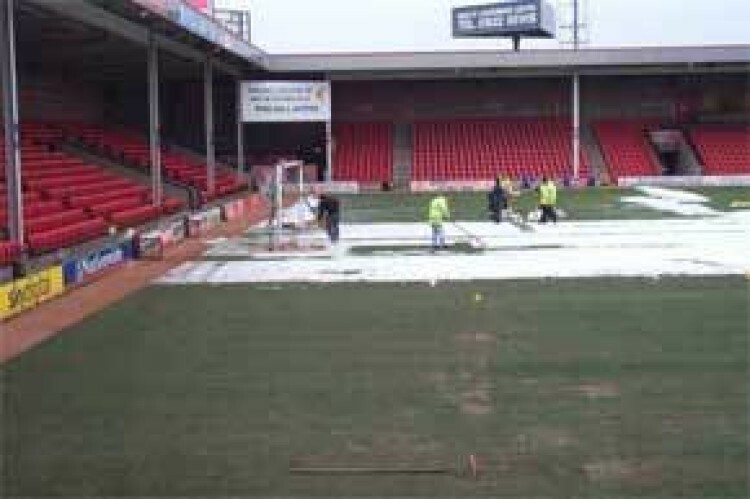 Unlike Chelsea, Walsall did not have a two week window in their fixture calendar, the period normally preferred for laying pitches in the winter. An unexpected away win in the FA Cup against Reading leading to a home fixture vs Wimbledon, meant the pitch had to be ready within six days. John Smith of the STRI was engaged as consultant to advise on how to ensure that (a)the underlying sand was suitable and (b) stability could be achieved between the turf and the sand. 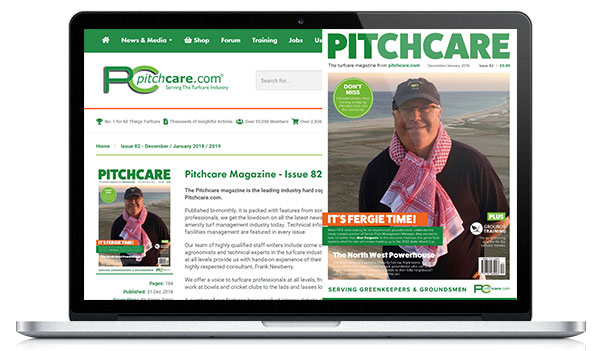 His advice was to strip off the offensive clay layer and incorporate a sandy loam into the sand. It was a high risk strategy but one which to their credit, Walsall was prepared to take. Normally Kestrel use the Field Top Maker to strip off the surface cover. However the clay layer simply glazed over and refused to pick up. The contingency plan to bring in a 360o excavator was put into place. For the Kestrel team this meant a lot of long hours to ensure the operation was on schedule. The snow which had fallen onto the Bescot Stadium surface on the Tuesday actually was a blessing in disguise since when it melted it made the turf heavier ensuring the turf stayed in place for the Saturday game. 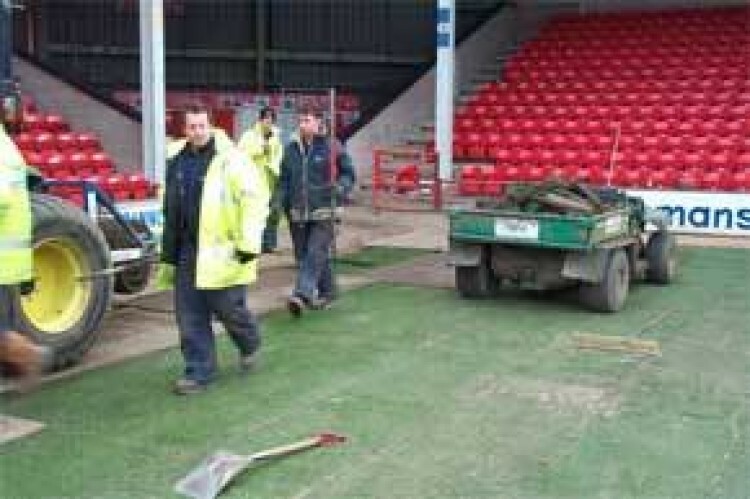 Due to weather conditions the turfing was not completed until the Friday before the game. Saturday morning found Paul Mason, the Head Groundsman marking the pitch and the Kestrel lads finishing off the tidying up. The proof of the pudding is in the eating. 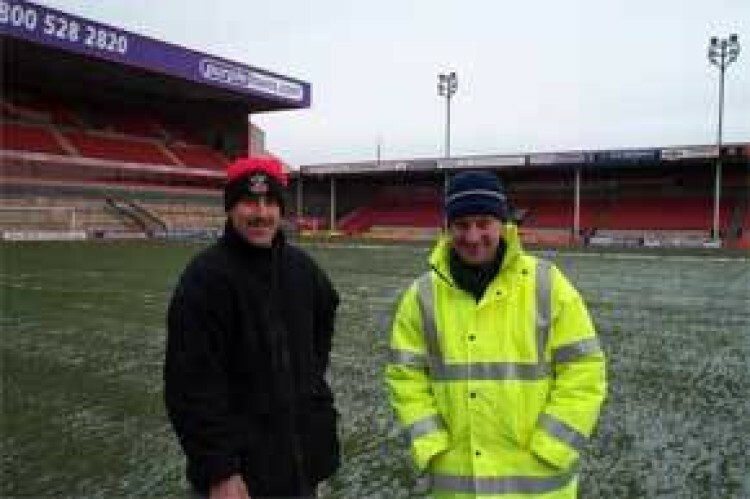 The pitch passed an early morning inspection and Walsall went on to beat Brighton 1-0. The Kestrel crew had a beer in celebration. Field Top Maker removes grass vegetation, through to evening. Excavators begin removing over 1000 tonnes of clay loam. Import and ameliorate 300 tonnes of rootzone into 50mm of sand. Laser grade and prepare for turfing. 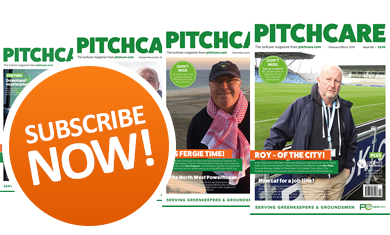 Frost in ground, snow on pitch. Complete tidy up - Groundstaff line mark.